Last year I taught a few cooking classes. 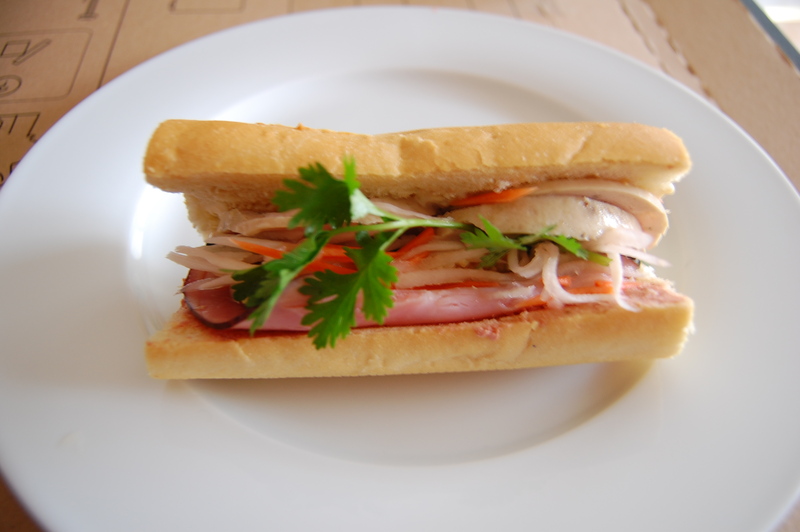 One of the classes I taught was a “Banh mi in a Pinch” Vietnamese sandwich class. My menu consisted of banh mi xa xiu (meatballs), 5 spice chicken, and the original thit nguoi (cold cut). I haven’t always loved Vietnamese food but I’ve always loved banh mi. For banh mi virgins, I beseech you to approach this with an open mind. If you try this with your nose turned up and picking at the ingredients for a disgusted bite you’re doing it wrong. The sandwich you get at the bakery comes ready to devour. Take a bite and enjoy the savory meats, varied textures and flavor explosion. What you get with the thit nguoi is effectively Vietnamese bologna, ham and head cheese. By itself you probably wouldn’t find yourself nibbling on these cuts but if you can palate Italian subs, pate, scrapple, or hotdogs you’re not far off here. I’m not sure if I’m winning anyone over with this but seriously banh mi sandwiches are a must try. The suburbs is the place for me, but the variety of ethnic eats out here is slim. So with a quick trip to Harris Teeter and the International grocery store I can fulfill my cravings for banh mi. Now don’t get me wrong it’s not an exact replica of what you get at the Vietnamese bakery, but the flavors are there and it’s good enough to tide me over until I cave and drive the hour to get my banh mi fix. Here’s a recipe for both banh mi lovers and banh mi noobs. You will want to give yourself some lead time with the pickled vegetables but if you have that readily available this sandwich comes together much quicker (notice my ragu jar – no I don’t add tomato sauce I keep my pickled vegetables in recycled glass containers). Mise en place! Get all your fixins ready. 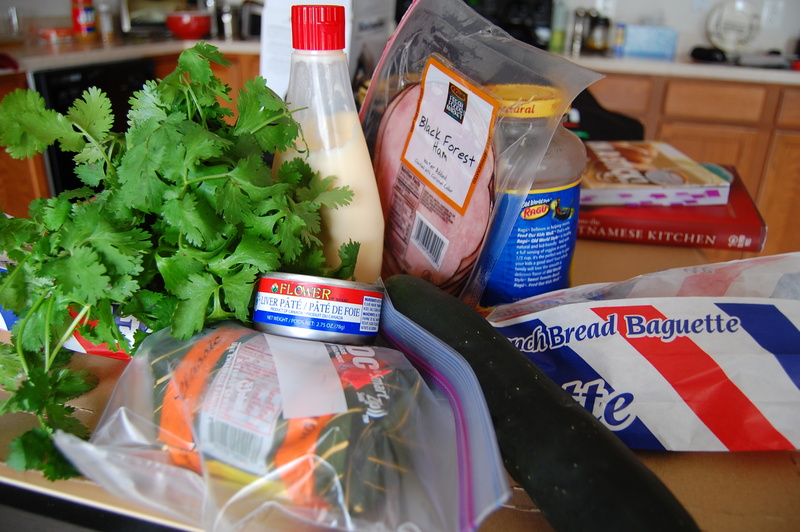 Assemble banh mi – inside the baguette spread the mayo one side and pate on the other. Add 3-4 slices of cha and 1-2 slices ham per baguette. Careful not to over stuff, there’s a delicate balance here and you want to allow all the flavors to shine (speaking from greedy experience). Top with cilantro, pickled vegetables, and optional toppings if desired. i heart scrabble and tetris. i think about food all day long.